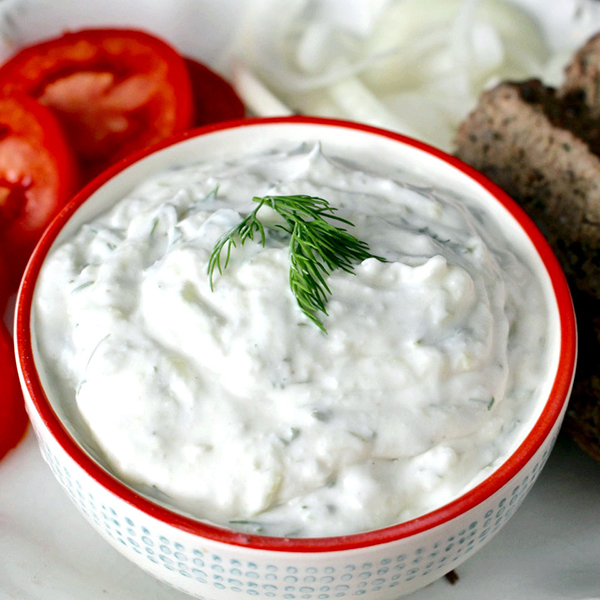 This Paleo Tzatziki Sauce is so simple to make and is loaded with flavor. It is dairy free, gluten free, and Whole30 compliant. I could have just added this sauce to they Paleo Gyro recipe, but I felt like it needed it’s own separate page. Mainly because I don’t want it to just get looked over, but also because I have made it just to dip veggies in and it is so good! So even if you don’t plan on making the gyros you should try this sauce. My husband who hates cucumbers, totally loves this! I guess it’s just the way it’s combined with the garlic, dill, and onion that makes it so good. I use coconut cream which thickens up in the fridge. If you put it on warm meat it will become much thinner- just a warning. This is so easy to make and has become one of our favorite sauce and dips. Updated with low fodmap alternatives in the notes! Combine all ingredients in a bowl and refrigerate until needed. Mixture will be very thick, but will thin out as it gets to room temperature. Best if made at least 1 hour ahead, even better overnight. *Low fodmap version: use 2 teaspoons garlic oil and 2 tablespoons chopped chives in place of the garlic and onion.